Why not take a try with Pavtube ByteCopy for Mac – an efficient, safe, fast and easy-to-use Mac Blu-ray Ripper able to rip Blu-ray and DVD sources from one format to your target format effortlessly and directly. As a powerful and multifunctional tool, Pavtube ByteCopy for Mac can produce various output video formats including your target format-M4V which is quite common. Apart from watching Blu-ray movies on your Mac via iTunes, you can also play M4V videos on your TV via a small Apple TV 3 by connecting Apple TV 3 and TV with a HDMI cable. In this way, you can enjoy pictures and videos as well as your converted Blu-ray movies in your iTunes with a remote control. Step 1. Load Blu-ray disc to ByteCopy for Mac. Double click the best Blu-ray Ripper for Mac to run it. Click “File” and “Load from disc” to import your Blu-ray disc. Here please note that an external Blu-ray drive shall be installed to identify and read your Blu-ray disc. Sources like Blu-ray folders/ISO Image files and DVD discs/folders/ISO Image files/IFO files are also supported by Pavtube ByteCopy for Mac. Clicking the “format” bar where you can find various output video formats. Here we can choose “Apple TV” and “Apple TV 2/3 720P Dolby Digital Pass-through (*.m4v)” or “Apple TV 3 1080P Dolby Digital Pass-through (*.m4v)” as your target video format. If you’ve got other devices like tablets, smartphones and game consoles, choose corresponding output format for them. After choosing M4V as the output video format and setting the destination file you want to store your M4V video on the Mac, click the big red button “Convert” which is quite obvious on the main interface to start format conversion. 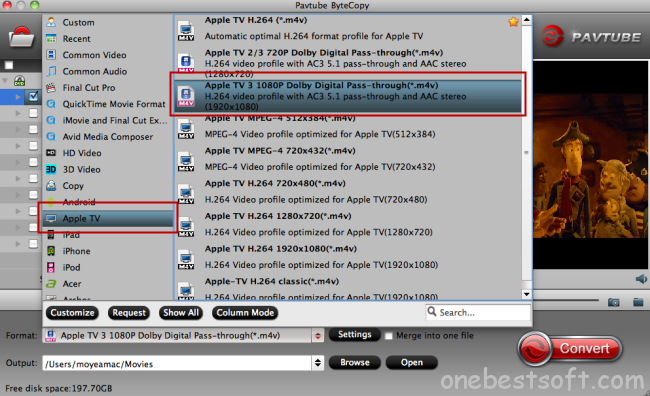 What a straightforward and easy-to-use converter Pavtube ByteCopy for Mac is! In addition to Blu-ray discs to M4V conversion, let’s take a look at what else Pavtube ByteCopy for Mac/Windows can do for you. Produce multi-track MKV, MP4, MOV and AVI. Other popular video formats are also allowed. Able to copy the entire disc with all audio streams, subtitle tracks and chapter information preserved. Backup the Blu-ray M2TS or DVD VOB main movie from the original disc with those annoying previews, warnings and promotional clips removed. Create 3D video out of 2D Blu-ray/DVD movies and 3D-3D conversion is also supported. A small preview window allows you to watch the movie first before conversion. Create your very own video for entertainment. Wanna save your money? Go to www.multipelife.com/summer-2014-deals to take a close look. Rip Blu-ray to ATV4 on Video Projector with Screen 92"
How to rip Blu-ray using Handbrake alternative?